NFFE/IAM organizers canvassed hundreds of NFFE/IAM Local 178 members and other potential members in an election campaign at the Army Contracting Command (ACC) at Aberdeen Proving Ground in Gunpowder, MD. Employees of the Army Contracting Command (ACC) at Aberdeen Proving Ground in Gunpowder, MD have a rich history of NFFE/IAM representation. However, a recent agency realignment brought a new group of contractors to the base, forcing a combination between new and veteran Aberdeen ACC employees. The new contractors also had a history of union representation. With the two unions at odds regarding representation, the U.S. Army filed a petition with the Federal Labor Relations Authority (FLRA) requesting single-union representation for the newly-combined ACC employees. The FLRA upheld the petition which set the stage for a winner-take-all election to determine union representation. NFFE was determined to continue its proud representation of Aberdeen Proving Ground ACC employees. Losing was not an option. Following the FLRA election notice, NFFE/IAM Local 178 mobilized to defend their members. Local NFFE officers worked with the national office to develop a winning election strategy. While spirits were high following countless organizing discussions, the outcome was uncertain because the preparations of the competing union were unknown. All of the preparations came down to one week: election week. The NFFE team dispatched numerous staff members to Aberdeen to help Local 178. The days were long, with the NFFE team often huddling before sunrise and canvassing into the night. Every step of the way, the NFFE team received positive feedback from local members and bargaining unit employees. 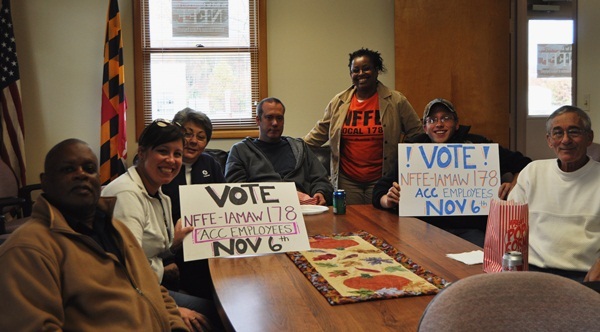 On Election Day, NFFE received encouraging reports from voters and Local officers. And nearly an hour after the polls closed, the results were in. NFFE won, in a landslide. The final vote was 88 percent for NFFE/IAM and 12 percent for its competitor – a 76-point margin of victory. Clearly, the grassroots campaign paid off in a big way. NFFE Local 178 will continue to represent ACC employees at Aberdeen Proving Ground and will be welcoming hundreds of new bargaining unit employees. The vote demonstrated the satisfaction NFFE members had with the representation they were receiving.